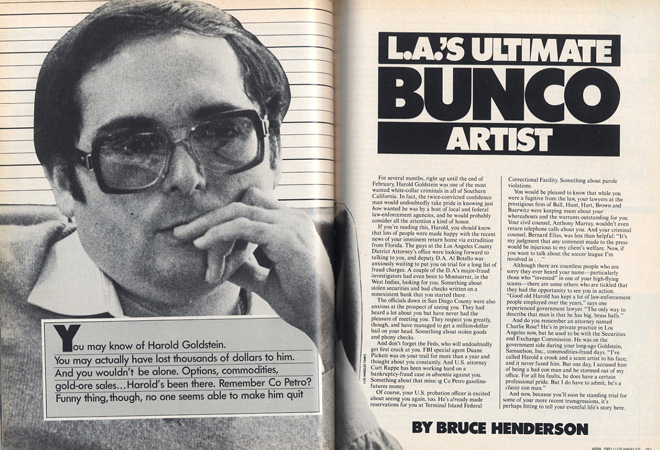 In April 1981 Los Angeles magazine profiled Harold Goldstein, whose mastery of finance fraud made him one of the most wanted white-collar criminals in the country. Accompanying the story was reporter Bruce Henderson’s list of precautionary tips for local investors. You may know of Harold Goldstein. You may actually have lost thousands of dollars to him. And you wouldn’t be alone. Options, Commodities, gold-ore sales…Harold’s been there. Remember Co Petro? Funny thing, though, no one seems able to make him quit. Don’t make investments or buy other major products over the telephone from salespeople and companies you don’t know. You cannot sue a disconnected phone number. Research a firm before you give it your money. Ask for bank and credit references and check them out. When you talk to a bank reference, find out not only how much money the firm has on deposit but also where it has a loan history with the bank. Just because a firm has a six-figure bank balance doesn’t mean it is a legitimate corporation. Its directors may simply be drawing interest on their victims’ money before taking off to the West Indies next week. Visit a firm’s office before making an investment. Find out from the landlord or other tenants how long the business has been in the building. Be suspicious of all promises, especially if the firm’s name on the door is written in wet paint. Be on guard if you hear the buzzwords tax shelter and get rich quick. They often result in the same thing: loss of investment. While a lost investment is sometimes a tax deduction, it is not the kind you want. Check with the local Better Business Bureau for any complaints against the firm. But just because there aren’t any complaints doesn’t mean the firm is legitimate; it sometimes takes six months to a year for complains to appear in consumer-information files. If any firm says it will send a messenger over for your check, tear up your check and put your life savings on the horses or into some other more reliable investment. Anyone who needs your money that quickly has more problems than you do.